← How many stripes do tigers have? How many types of tigers are there? Scientifically speaking a ‘type of tiger’ is a subspecies so the question could be rephrased: How many subspecies of tiger are there? And the answer based on a recent study analysing the complete genome of 32 tigers is that there are 6 types of tiger. These are the Bengal, Amur, South China, Sumatran, Indochinese and Malayan. Three other types of tiger are extinct: Javan, Caspian and the Bali tiger. All these tigers are discussed on this website in detail. The genetic study was carried out by an international team of scientists. All modern tigers are descended from a common ancestor. This tiger roamed China and southeast Asia 110,000 years ago. During climate change at the time, which cooled the planet, the tiger population fragmented causing the creation of subspecies by natural selection. “Tigers are not all alike. Tigers from Russia are evolutionarily different from those from India. 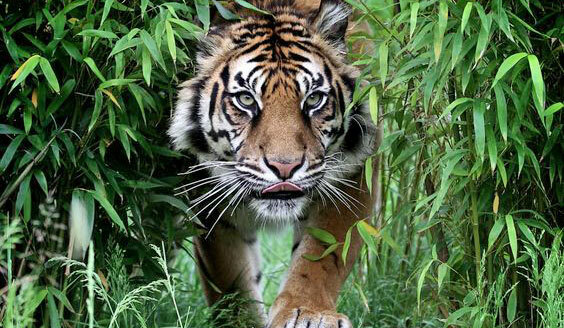 Even tigers from Malaysia and Indonesia are different.” – She-Jin Luo of Peking University. Today’s tigers occupy 7% of their previous historical range. Tigers have existed for up to 3 million years. Today’s tigers can be traced back to a common ancestor that lived in the late Pleistocene period around 110,000 years ago. The Sumatran tiger is the smallest. Its smaller size evolved to reduce energy demands which it had to do as the prey on the island was smaller, such as wild pigs. Tigers need large prey to survive normally. Rhys Blakeley writing for the Times newspaper says that the discovery could complicate conservation programs. “Having fewer subspecies to manage generally gives conservationists greater flexibility”. This entry was posted in Tiger and tagged conservation, tiger, tiger conservation, tiger facts by Michael Broad. Bookmark the permalink. No matter the subspecies of tiger, all are beautiful and deserve to be protected. Interesting article, Michael. I did not realize that are 6 types of tigers, and another 3 that are extinct. These big cats are fascinating. Thanks Frances. I am pleased you read it 😉 A lot of people are disinterested in the wild cats.